BuildBlock is excited to launch the first online training portal for ICF Construction. Click “Login or Register” to register for a free account. Click the courses tab to see all available training courses. New courses are added periodically. Select your course, create a simple profile, and start learning today for free! Signing up takes seconds and all courses are self paced. Enroll in the Free Online Course! Get a preview of what’s inside. Watch the BuildBlock ICF Training Videos in any order at any time without enrolling in the online course. 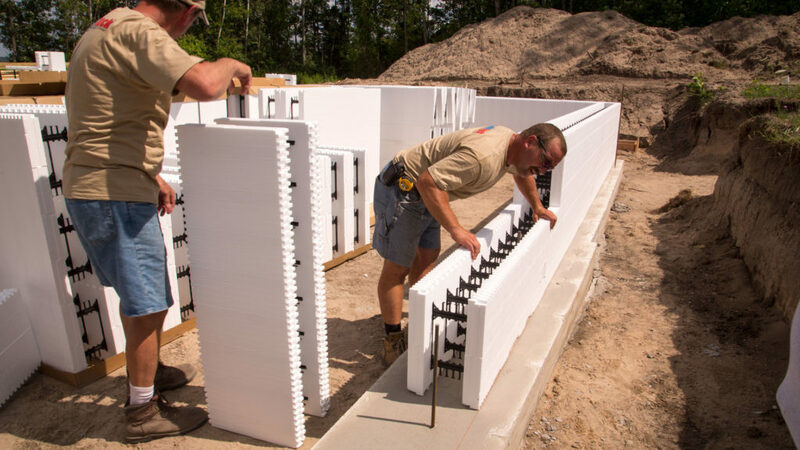 Watch the BuildBlock ICF Training Videos! BuildBlock provides training materials through this website and our Youtube Channel youtube.com/buildblock. This training portal is designed to be an introduction to ICF installation and other topics. BuildBlock Distributors also provide regional training in their areas. Our technical staff is only a phone call or email away when you need them most. Our technical staff can also provide on-site technical services for your project or a custom training course for your staff for an additional fee. Contact us today for more information. ICF basement walls being stacked on to a footing. BuildBlock also conducts a distributor convention every few years. Whether it is networking with other BuildBlock distributors, learning new tips & tricks, or polishing their business every attendee said they recommend this training to others and found it to be a good value for the investment. The national ICF Summit is presented each year by the Insulating Concrete Forms Manufacturers Association at the World of Concrete.